ATLAS shelving features a true powder-epoxy over zinc-chromate electroplating that ensures a strong durable bright silver coloured finish as well as in-built anti-microbial properties to inhibit bacterial growth. This shelving handles high heat and coolroom/freezer/high moisture environments with ease. All ATLAS wire shelving comes with a TEN YEAR WARRANTY against rust and corrosion. All ATLAS wire shelving is manufactured under strict quality control procedures and manufactured with anti-microbial protection. The open wire truss reinforced shelves feature front to back welded surface ribs for added strength which increases free air circulation and visibility. Easily adjustable and expandable to change with your needs, shelves adjust on 25 mm (1”) increments. 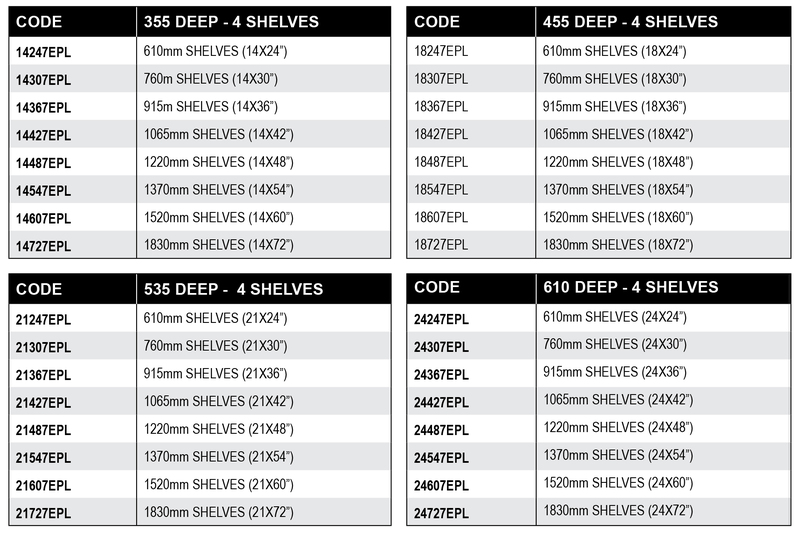 Each shelf has a load bearing capacity up to 200 kg (spread evenly across the shelf). Shelving units are available in kit form with four or five shelves, in wire or removable plastic mat to suit any application. Individual shelves, posts and accessories are also available. A large stock inventory allows fast delivery Australia wide.